Carbon Interior and cherry plywood. double bedroom with bathroom with shower cabin in the bow 01 02 Cuccettoni aft 2 + 2 beds. 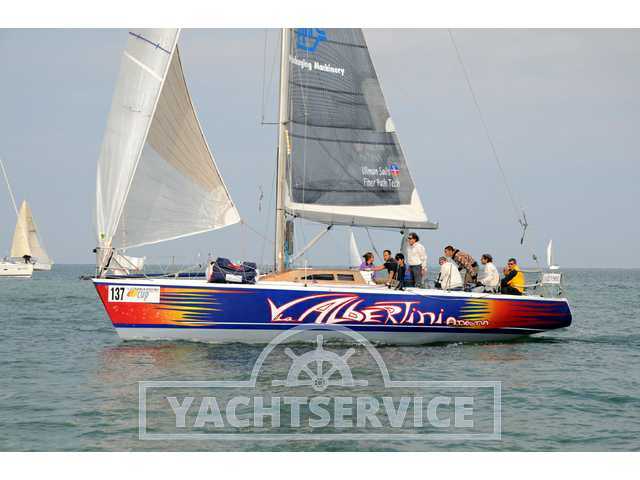 n° 01 02 03 Olympic Rande no swashbuckling trysail Genoa Genoa n° 03 SPI # 06 Winches storm jib 02 02 storage including a carbon spinnaker pole 12 v. 02 electric bilge pumps at mast foot + manual. Double cradle aluminium steering bar reservoir outside shower aluminum mast bulb with lead and carbon technical and fast Boat has always calssificata the first places. The milage has not been independently verified but the engine is only used for the entry and exit from the port.